History: (What If I#23) - While the Hulk fought the Crypto-Man, Jarella noticed a young boy who was going to be crushed by falling rubble. She was preparing to leap to the rescue and sacrifice herself for the child, when the boy flickered out of reality for a second, which caused her to hesitate. The hesitation caused the child to apparently be killed. Just then Hulk demolished Crypto-Man, causing feedback which killed the robot's controller. Jarella told the Hulk of the boy, but when he searched the rubble, the Hulk found no trace of him. Over the following weeks, the Hulk and Jarella enjoyed a peaceful life, though Jarella wished that the Hulk could be as smart on Earth as he was in her home dimension. With the sudden appearance of a fleet of military helicopters, the Hulk was prepared to fight, but Clay Quartermain announced from within a copter that they were there to help. They took the pair to Gamma Base where Henry Pym announced that new realizations about the nature of the Microverses had allowed him to create a machine that would let Jarella and the Hulk go to K'ai. Thus, with Betty Ross, her father and Glenn Talbot there to see them off, the two went back to K'ai. On K'ai, Bruce had complete control of his mental faculties as the Hulk once more. Jarella sensed an evil presence in the land, but Bruce shrugged it off. They were greeted by Torla, Holi and Moli, the Sorcerer's Triad. Only days later Bruce and Jarella were wed.
Bruce began to also feel the evil that Jarella spoke of. Finally, one night when a strange tentacled creature attempted to kill Jarella while she slept, Bruce and the Spoor-Men of K'ai sought the cause. They found a sorcerer sacrificing a girl, who was annointed with a letter that meant 'Jarella', before idols of the Dark Gods. The sorcerer told the Hulk that he could not stop the Dark Gods, then melted. 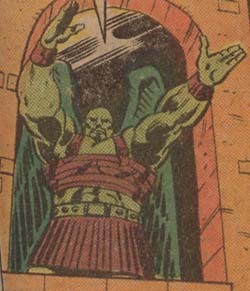 Bruce shattered one of the idols and swore that he would smash the Dark Gods. Days later the Royal Council met to discuss the horrible events occuring across the land. The dead were rising from their graves, strange funguses grew over buildings and machines rampaged through the countryside. A team of heroes gathered from all over K'ai, including Cnerla of the Knives, Great Hrond, Ythaer the Swift, Fiece Vidias and Glunno the Winged One, and pledged to fight alongside the Hulk against these evils. 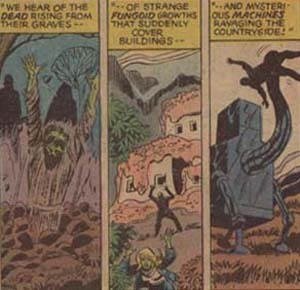 Torla explained that the evil forces likely came from the mountain of Wol Ulrai, so Bruce, Jarella and the "Super Heroes of K'ai" headed to said mountain. Upon reaching Wol Ulrai the team was attacked by the "Spawn of the Dark Gods". The heroes fought the horde until all the demoniac creatures had been defeated or fled. 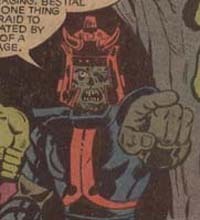 They were then confronted by the reanimated corpse of Lord Visis, a traitor to K'ai who had been defeated by the Hulk. Now serving as the voice of the Dark Gods, Visis explained that it was they who reanimated the Crypto-Man and created the illusory child in an attempt to kill Jarella. He also revealed that they had used the ancient mystical technology to create an incarnation of the Hulk's beastial nature and presently unleashed it upon Jarella. Bruce overcame the monster and threw it into the mountain, bringing it down and crushing Visis. 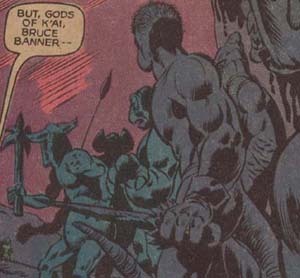 Bruce swore to protect K'ai from the Dark Gods from then on. There's every reason to assume that the heroes of K'ai such as Cnerla and Glunno have counterparts in the Microverse connected to Earth-616 (as all the micro-realms have combined there) who have yet to be seen. 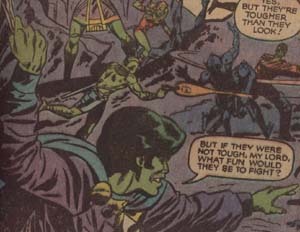 The issue mentions that it is only their battle against the Dark Gods and their loyalty to the Hulk that got these guys to look past their cultural differences, so if they do exist in our universe, they might not get along. And the mountain Wol Ulrai likely still stands there as well. The Dark Gods of Wol Ulrai are said to be the same gods that are worshipped by Psyklop. My choice would be the N'Garai, but it remains unclarified. The original motive was an escape from anonymity, but that could have been his reason for joining a cult in the first place. This universe diverges from the mainstream at Hulk II#205, the death of Jarella during the fight with the Crypto-Man, since here she didn't die. Plus, there's nothing in the original to suggest that Crypto-Man's controller was part of a Dark God worshipping cult or that the child was an illusion, but to get technical, there was nothing to say they weren't. "One of Octavius's earlier crime sprees was the incident that cost former police captain George Stacy his life, a murder that to this day remains unsolved, since Spider-Man has refused to surrender himself to the authorities. (See EDITORIAL Page A17) During Spider-Man's reckless and dangerous battle with Octavius, Stacy attempted to save an innocent boy who crossed the line into the danger zone. (And who else has this boy killed, hmm? Captain Stacy and Jarella, and who else that we don't know about, hmm?) According to eyewitness reports, Spider-Man, enraged, ripped free a chimney and hurled it into the crowd below, mortally wounding Stacy. Some witnesses state that is was Octavius who knocked the chimney free, but this paper maintains that if Spider-Man hadn't been fighting him in the first place, the whole thing never would have happened, so it's all Spidey's fault (See EDITORIAL Page A17) Though we're still curious about that boy." Just a cute reference, or incontrovetable proof that everything is not what it seems? Could the Dark Gods have brought ruin to Captain Stacy as well? I rest my case. Update: Aparently the reason I couldn't find anything on Tarraconia is because the issue actually meant to refer to Terragonia. Cnerla of the Knives was a hero of the planet K'ai who answered the call of the Royal Council and joined the Hulk and Jarella on their battle to Wol Ulrai to fight the forces of the Dark Gods. Dressed in something of a swashbuckling fashion and with an air of the rogue about him, Cnerla covered himself with a supply of throwing knives which he could throw very skillfully. He was happy to fight alongside the Hulk and seemed to be enjoying himself. Glunno the Winged One was a hero of the planet K'ai who answered the call of the Royal Council and joined the Hulk and Jarella on their battle to Wol Ulrai to fight the forces of the Dark Gods. Apart from having wings on his back which allowed him to fly, Glunno could communicate with the large bird-like animals native to K'ai. He told the Hulk "They are my brothers, Bruce Banner-- even as you are!" The birds served as transportation for some of the heroes to reach Wol Ulrai, and though the birds were too afraid to go to the mountain themselves, Glunno fought the hordes of the Dark Gods alongside the other heroes. 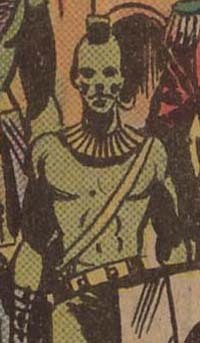 The great Hrond was a hero of the planet K'ai who answered the call of the Royal Council and joined the Hulk and Jarella on their battle to Wol Ulrai to fight the forces of the Dark Gods. Hrond was a particularly large man and seemed to possess a degree of strength beyond the norm for his kind. Upon meeting the Hulk he told him "We have heard of your strength and courage, Bruce Banner, and we will be honored to fight alongside you-- to the death!" It did not come to that however as the battle at Wol Ulrai was won without a loss of life for the heroes. Fierce Vidias was a hero of the planet K'ai who answered the call of the Royal Council and joined the Hulk and Jarella on their battle to Wol Ulrai to fight the forces of the Dark Gods. 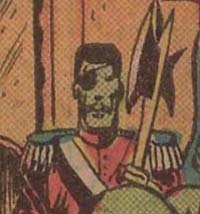 He wore what appeared to be a military uniform and had an eyepatch suggesting he was a seasoned veteran in battle. He wielded a large battleaxe in battle and was seen to take out more than one opponent at a time with a single swing. 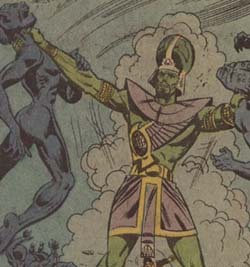 Ythaer the Swift was a hero of the planet K'ai who answered the call of the Royal Council and joined the Hulk and Jarella on their battle to Wol Ulrai to fight the forces of the Dark Gods. Short (even by the standards of a race from the microverse...) Ythaer dressed lightly (perhaps from a primitive or just hot region of K'ai) and carried two pistols which he used very skillfully and quickly, which is, no doubt, how he earned his name. He also had a sheathed sword on his person, but was not seen to use it. The Spawn of the Dark Gods marched forth from the mountain Wol Ulrai to fight the heroes of K'ai. Hrond wondered "Were these once men-- or were men once such as these??" The twisted demonic figures fought until all of them were defeated or had fled. They came in a wide variety, some had tails, others claws, some extra limbs and others horns, but none proved particularly challenging to the heroes.